Do you know how to tell the difference between simple and serious cases of upset stomach in dogs? Understanding the difference can help you decide whether you can treat your dog at home or if you should take your pet to the vet for a thorough examination. Just like people, it's not uncommon for a dog to get an upset stomach from time to time. The situation usually isn't too serious and will usually pass on its own. In other cases, an upset stomach is a symptom of a more serious illness. Veterinarians often refer to an upset stomach as a case of gastritis. This is because the inside of the stomach is lined with gastric folds that help break down food particles during digestion. If the stomach lining becomes irritated or infected, a case of gastritis results. You may notice any combination of the following signs in a dog with an upset stomach. More often than not, diet is the cause for most upset stomachs. This happens for numerous reasons that include eating too much, too little or too fast, as well as eating foods that the dog isn't used to receiving such as table scraps. Dogs are notorious scavengers, and it's not uncommon for a dog to have an upset stomach as a result of raiding spoiled food from the family trash bin. 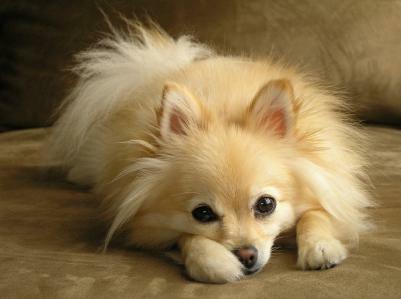 Dogs sometimes ingest non-food items that also cause stomach upset. If the upset stomach seems worse than average, there could be a virus involved. Viruses such as parvo and corona produce a lot of vomiting and diarrhea. Your vet is the most qualified person to decide which treatment your dog may require, so don't hesitate to call the clinic, describe your dog's symptoms and see if the vet thinks you should bring your pet in for an exam. It's always better to err on the side of caution rather than ignore what might be sign of a more serious condition. The first thing vets typically recommend is to withhold food for approximately 24 hours. This gives the dog's stomach time to rest and hopefully recuperate. Make fresh water available, but make it available in small amounts on a frequent basis. This will keep your dog from overfilling his stomach and possibly prolonging the upset. Sometimes vets will advise a care giver to give the pet a dose of Pepto-Bismal or a similar product to coat the stomach and bring some relief. One or two spoonfuls is usually sufficient, but do consult your vet for the appropriate dosage which will be based on your dog's weight. If the upset stomach is more severe than average and leads to vomiting and/or diarrhea, dehydration becomes the most immediate concern. In cases like this, the vet will examine the dog to determine the extent of the dehydration. If it's not too severe, the vet may opt to give the dog a subcutaneous saline injection to help rehydrate him. If the dehydration is more pronounced, the vet will administer intravenous fluids and possibly some medication to help relieve the vomiting and diarrhea. You know your dog better than anyone, so trust your instincts when you sense there is something wrong. An upset stomach in dogs can indicate anything from a simple case of indigestion to a very serious illness. Consult your vet in order to determine what kind of treatment your dog needs.